After more than 14 months in pre-trial detention, Oriol Junqueras, the former vice president of the Catalan regional government, is set to go on trial January 22, 2019, in Madrid on charges of “rebellion, sedition, and misuse of public funds”—for his central role in organizing the October 1, 2017, referendum on Catalonian independence. That referendum was disrupted by the intervention of Spanish riot police, who seized ballot boxes and dispersed voters in brutal actions, after the Spanish executive and judicial authorities had declared the vote illegal. An investigation by Human Rights Watch concluded that police used excessive force when confronting voters and demonstrators, hitting non-threatening protestors with batons and resulting in 893 reported injuries. Eleven others will also be on trial with Junqueras in a televised proceeding in Spain’s Supreme Court. Imprisoned civil society activists Jordi Cuixart and Jordi Sànchez, who have recently launched hunger strikes in protest against their incarceration, also face charges for their advocacy of the referendum. Another dozen indicted politicians and activists, including the former president of the Catalan regional government, Carles Puigdemont, fled to other European countries—which have thus far declined to extradite any of the accused back to Spain for trial. While PEN America takes no position on the merits of Catalonia’s quest for independence, the heavy-handed effort to disrupt the vote, and the prosecution of its organizers, represents an unacceptable restriction on peaceful free expression on the part of a substantial subset of the population. Nearly 2.3 million votes were cast (43 percent of registered voters) despite the police violence against voters and election administrators, and 92 percent of those voters supported independence. However, an unknown additional number of ballots were never counted, after being seized by the police. Spanish authorities’ reaction to pro-independence speech in Catalonia is part of a troubling broader trend in the country toward shrinking the space for dissenting opinions in Spain. Rising numbers of prosecutions under Article 578, which criminalizes “glorifying terrorism” or “humiliating” its victims, has led to convictions for song lyrics, puppet shows, and tweets. The law, popularly known as the “gag law,” led to the prosecution and conviction of rapper Valtònyc and rap collective La Insurgencia, in addition to the now overturned conviction of student Cassandra Vera for a tweet in 2016. Most of the cases prosecuted under Article 578 relate to alleged “glorification” of now disbanded or inactive domestic groups, particularly ETA and GRAPO. On February 22, 2017, musician and poet Valtònyc (the stage name of Josep Miquel Arenas Beltrán) was sentenced to three years and six months in prison for his lyrics, which the court said contained glorification of terrorism, slander, and defamation of the crown. Arenas’s legal team argued that rap often contains provocative and symbolic language and that the genre has drawn on expressions of frustration with societal ails since its inception. Criminalizing rap lyrics, they argued, restricts free expression. One of Valtònyc’s most well-known songs, “Tuerka Rap” criticizes the Spanish royal family for its relationship with the Saudi royal family and for their spending habits. After sentencing, he fled to Belgium, where courts decided last September that they would not comply with Spain’s request for extradition. The right to dissent and to express and disseminate one’s ideas are critical components of free expression and a cornerstone of democratic society. 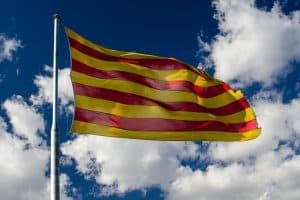 While Valtònyc’s lyrics may seem objectionable or hard to defend by observers, their prosecution under anti-terrorism laws demonstrates an outsized response that could lead to self-censorship of politically controversial or satirical speech. An environment of shrinking space for open debate may bear particularly heavily on some of the Spain’s long-lasting separatist conflicts. On October 27, 2017, the Parliament of Catalonia unilaterally declared independence from Spain. The proposal presented by the pro-independence political parties Junts pel Sí and Popular Unity Candidacy was approved with 70 votes in favor, 10 against, and 2 blank votes, while 55 MPs from the opposition refused to be present during the voting. To be sure, current polls and recent elections show that Catalans remain divided on the issue: The most recent poll released by the Center for Opinion Studies (CEO) in July 2018 found 46.7 percent in favor of independence while 44.9 percent were opposed. In regional elections in December 2017, pro-independence parties secured a majority of seats in the regional legislature, though the largest party opposes secession. What has been consistently clear in the polls is a desire for Catalans’ voices to be heard on the matter, with 70 to 80 percent of respondents consistently expressing support for a referendum in every poll since 2012.